Snipe are ground-nesting birds that breed wherever there are suitable lowland and upland habitat. Suitable habitat includes wet areas on bogs and moorland, unimproved pasture and meadows and ideally with areas of tussocky vegetation that provides shelter and protection. They also nest on the edge of watercourses and wet field corners. Choose an area that suits the time you have available. If you know a location that you have seen or heard snipe in spring or summer previously, this would be a good place to start. Commit to an area you can manage. Ideally, each survey location should be around 500m square. Feel free to survey as many locations as you like. Surveys should be performed at least twice at each chosen location. The first visit should be made between mid-April to mid-May and the second between mid-May to mid-June (leave at least 2 weeks between the first and second visit). Choose days with little wind. The wind has an important effect on the detection of breeding snipe so surveys should not be conducted when wind strength exceeds 19 km/h. Days with drizzle or light rain are acceptable as previous studies indicate drumming intensifies during damp conditions. The prime times to survey are during the 3 hours after first light and 3 hours before last light. In April and May, this typically means from 6 am to 9 am in the morning and 7 pm to 10 pm in the evening. 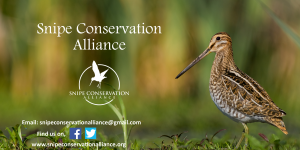 The most convenient method for counting is to walk through an area recording the number of snipe seen, displaying and/or drumming. If a vantage point can be achieved to view the entire area, then there is no requirement to walk. Disturbing nests is unnecessary and should be avoided. Spend as long as you can within the 3 hour period at dawn or dusk; ideally allowing a minimum of 1 hour per visit at each location. 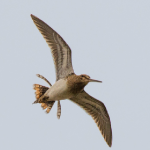 If no snipe are found during your first visit, record that information and complete the survey by making the second visit between mid-May to mid-June.